Bernadette was simply minding sheep when she saw 'a small young lady' standing in a niche in the rock at Massabielle . When the priest asked Bernadette to get the lady to identify herself, the answer given was, ‘I am the Immaculate Conception’. Fr John Murray PP tells the story. It is over 150 years since an obscure town in the Pyrenees mountains of southern France became a household name for Catholics all over the world. On 11 February 1858, Bernadette Soubirous, aged fourteen, was minding sheep with a sister and a friend when she saw what she termed ‘a small young lady’ standing in a niche in the rock at Massabielle, near the town of Lourdes. The other two saw nothing, but Bernadette was to return there on seventeen occasions for meetings with ‘the beautiful lady’. 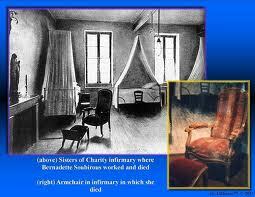 The story of Lourdes and Bernadette’s visions is well documented. The Lady did not identify herself until the seventeenth meeting, but from early on, many of the town-folk began to accompany the girl to her meeting with whom they assumed was the Virgin Mary. On the thirteenth meeting she was told ‘to go to the priests and tell them to build a chapel here’. Bernadette, accompanied by two of her aunts, went to the local parish priest, Fr Dominique Peyramale. He was a good priest, but he did not want to encourage any ‘pious fanaticism’ in his parish. So he asked the Lady for a sign – to make the rose bush beneath the niche bud and flower even though it was the middle of February. This happened. 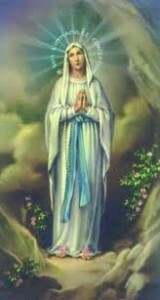 – I am the Immaculate Conception. When the priest later asked Bernadette to get the Lady to identify herself, the answer given was ‘Que soi l’immaculée concepcion’ – I am the Immaculate Conception. (Pope Pius IX had promulgated this dogma of Our Lady four years before in 1854.) The expression was certainly one unknown to a simple undereducated peasant girl and one which relatives said she would never have heard before. Despite rigorous investigation by officials of both the Church and the French government, Bernadette stuck to her story over the next months and years. Indeed her behaviour during this period set an example by which all who claim visions and mystical experiences are now judged by Church authorities. Her request for the chapel was in time granted, and the sanctuary at Lourdes was to become one of the major Catholic pilgrimage sites in the world. It is reckoned that nearly five thousand healings or miracles have taken place there, but the Church has recognized only sixty-seven. As for Bernadette herself, she was beatified in 1925 and canonized by Pope Pius XI in 1933. Her body had been exhumed on two occasions before this (in 1909 and 1919) and was found not to have decomposed. This was taken as one of the indications of her sanctity in support of the canonization. However it was her humility which was probably the greatest factor in raising her to the altars. When the apparitions were over, life could never be the same for Bernadette. She was constantly pestered by the countless pilgrims who were beginning to come to Lourdes, and on the advice of Fr Peyramale she decided to enter a convent. There were many offers from all over France, but in the end she chose the Sisters of Charity of Nevers. And so Bernadette, at age twenty-two, entered in the year 1866. Before going, she went for the last time to the grotto to bid farewell and to ask for help. Her parting from her parents was particularly sad as she knew that she would never see them again. Both would die within a few short years of her entering. The sisters at Nevers were pleased at receiving their new ‘little saint’. Yet things did not begin well. The mistress of novices, Mother Marie Therese Vauzou, was looking forward to their meeting and to her accompaniment of her new postulant, but that first contact was awkward – Bernadette was not as well educated as the older sister and was unable to respond. The mistress was embarrassed and from that day on, was openly distrustful of the new member. The occasional humiliations over the ensuing years were borne with humility and patience by the young sister. Her health too, became poor. Cholera contracted at eleven, wedded to the early nutrition of a peasant family, meant that she was always in poor health. Indeed, the last three years of her relatively short life were spent as an invalid. When the news reached the streets of Nevers, spontaneous shouts went up ‘The saint is dead! The saint is dead!‘ The local people knew the worth of the soul who had lived within their town’s borders – many had been the prayers granted and the healings won by her prayers. This year hundreds of thousands of pilgrims will visit this pre-eminent shrine of Mary. No doubt the prayers and the hymns will resound with an even more special fervour on this sesquicentennial anniversary. The little girl – with no special airs or graces – will be particularly pleased that ‘her Lady’ will be so honoured. 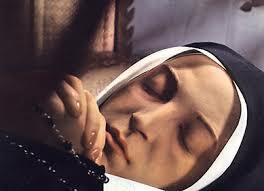 Her feast day is 16th April. This article first appeared in The Messenger (April 2008), a publication of the Irish Jesuits.